Nov. 2012 - I was working the night shift on an x-ray crew at a material gas plant. 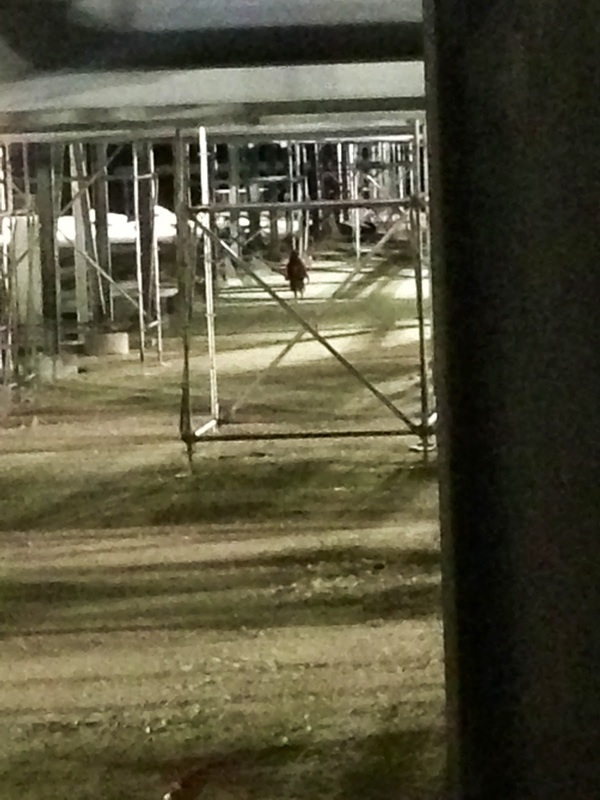 This was around 3 am and there was only four of us in the plant at the time. I took this picture after seeing something swaying side to side out of the corner of my eye. I was in the basket of a man lift coming down when I took the picture. By the time I unhooked my harness to get out of the basket the creature was gone. The police were called and walked premises. The officer told me there were 26 UFO sighting calls throughout that night. 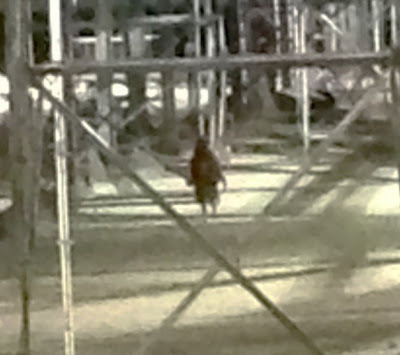 If you zoom in you can see the silhouettes of eyes and elongated mouth. I have no doubt of what I believed I seen that night. The other person that saw it with me took off running for the truck. You can use my name and the picture was taken near Kenedy, TX. I appreciate the quick reply. The picture was even printed in the local newspaper in Kennedy. I had sent the picture to the officer who came to the plant and assume he sent it to the newspaper. To the editor - I live near Beeville, Texas and want to report an incident from a few weeks ago. It was about 9:30 PM when I heard 'swishing' sounds coming from outside. I went to the back door in the kitchen and looked out. My yard was illuminated, so I walked outside onto the porch and suddenly noticed a wide disc shaped craft hovering above the house. It was at least 100 ft wide. In an instant I was hit by a beam of light and lifted off the top step of the porch. I was mid-air for almost 20 seconds, then slowly set down by the side of the tool barn. I was very groggy - almost like I was drunk. I then noticed a figure moving out of a beam of blue light that came directly from below the craft. This figure was about 5 ft tall and looked human - but the extremities and head looked as though it had been burned and charred. It reminded me of a zombie from TV. It moved closer to me - I was literally frozen stiff. As it got closer I became nauseated - it looked awful and had a putrid odor. It backed away as I started to wretch, then vanished into the blue beam of light. Without hesitation, the craft ascended swiftly - so fast that it created an instant vacuum that dropped me to my knees. I got to my feet and ran into the house. I was scared and worried something else may happen. Then I noticed the time - it was 10:40 PM. I had lost almost one hour of time. I still don't understand what happened to me or the time. I feel fine but I'm still very concerned. I never believed in UFOs or other weird experiences people have said they had. Now it has happened to me and I have a deep sense of dread. I talked to my close friend and she told me to search the internet. I don't know if she believed me but she was willing to help. To be frank, I am still concerned about contacting anyone about this. My friend gave me several contacts to try. I sent emails and filled a few forms. I never heard back from any of them. 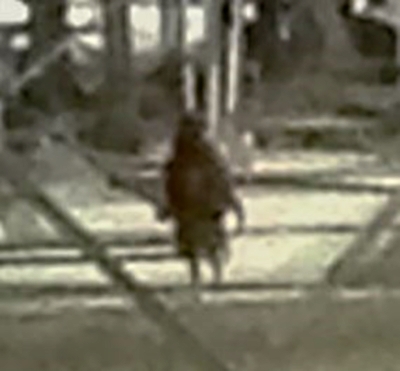 Then I found the photo of the entity from Kenedy, TX that was posted on your blog. That is what I encountered - I know that it is the same thing or another like it. I can feel it deep inside me. That gas plant in Kenedy is only 20 miles from me! Just yesterday, there was some talk that weird looking people were seen moving through a local field this past weekend. There was also a series of lights seen above the horizon at the same location. I don't know if this is related.